There are many similar community threads on force.com discussion boards around the same issue “No Debug logs” issue. This issue poped because of a bug in winter’11(20.0.0) Force.com IDE. The Force.com IDE team released an IDE update(20.0.1) on November 15, 2010 that addresses this issue. More details in screen shot below and IDE release notes page here. How to download this WSDL ? 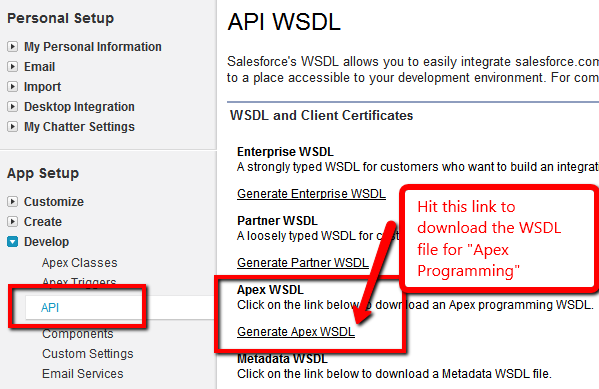 Apex programming WSDL can be downloaded from “Setup” area of your Salesforce org. Just land on “App Setup > Develop > API” page. Instructions to download are shown below. Integrating with “Apex Programming WSDL” ! Fortunately, one can also generate Apex code stubs for a given WSDL i.e. 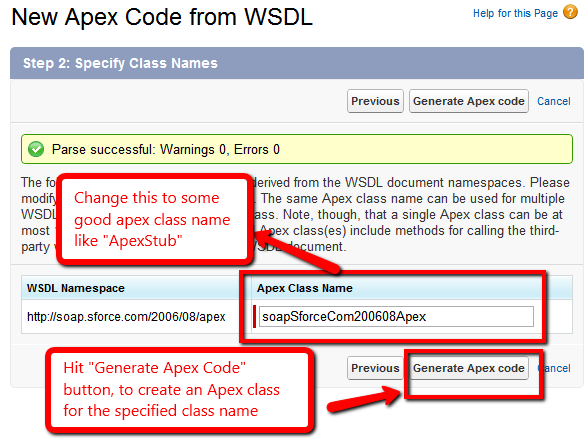 force.com platform gives you an option to do “WSDL > Apex” compilation. 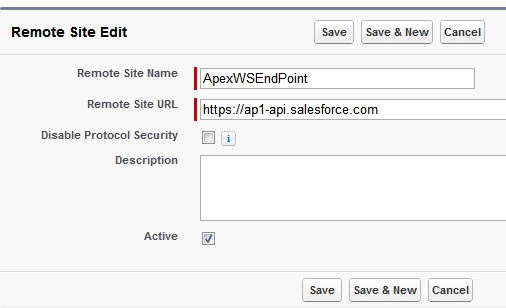 Using this feature, we can bring the who bunch of web service exposed by “Apex WSDL” to Apex code directly. So, lets hit the button showed in above screenshot i.e. 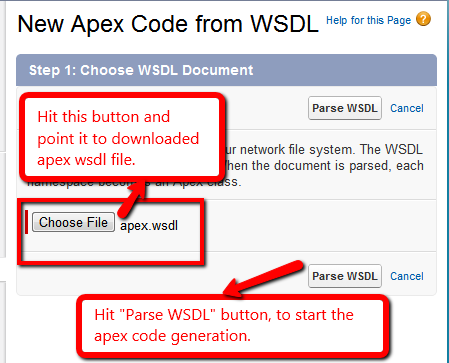 “Generate from WSDL” and specify the downloaded “apex.wsdl” file, here, as shown below. In next step, you will be asked to give a good name to the generated Apex class, by default it will come with something like “soapSforceCom200608Apex”. Detailed instructions shown below. Next, we will see how to invoke Apex WSDL web services from Apex code directly. In this section I am assuming you have already generated “ApexStub” class by compiling Apex WSDL, as described above. Step 1 – Know your web service end point ! As we are going to make web service calls from Apex code, we need to whitelist the web service endpoints first. To know your web service endpoint, there are two ways i.e. 2. You can also check your endpoint directly in the ApexStub class. “ApexStub.Apex.endpoint_x” property points to the web service endpoint. To white list, goto “Setup > Administration Setup > Security Controls > Remote Site Settings” and create a “New Remote Site” using the domain details from endpoint captured in steps above. Make sure remote site url is as per your SFDC org, my org is on node “ap1”, yours can be different i.e. on NA1 etc. My security settings are shown below. Step 3 – Coding time, make the web service call ! Out of all web service calls given by Apex WSDL, most interesting for me is runTests(). This allows one to run tests on either a single, bunch or all apex classes in sfdc org. Here is the sample code that uses the “ApexStub” class generated above to run all tests in the org. // This is important, give session id, to let the call work. Create various RunTestsRequest, check this API Doc. Parse RunTestsResult object, check this API Doc. Making Apex WSDL calls from Apex – Limitations !! As we are making web service callouts from Apex, all the governor limits imposed on web service callouts are applicable here too. For ex. Out of these two only the first one limits us most from doing anything super creative from Apex. So you can’t run all/single/bunch tests, if they consume more than 120 secs to complete. This is pretty easily possible with an org with decent number of apex classes. So one can’t go straight forward and do anything with Apex WSDL calls. Creating a Junit like Test Suite using Apex WSDL. Junit is a unit testing framework in Java. Many bits and pieces of Apex TestCase class are inspired from this framework itself. A nice feature that’s given by Junit is ability to create TestSuites. A TestSuite is a Composite of Tests. It runs a collection of test cases. The beauty of test suites is you can create small suite of tests per feature or module of your org, this suite will have test classes for the feature/module only. So when you change something, its really not required to run all the tests, you can just run suite and see if everything for the feature is stable. Apex Test Suites & ApexClass Sobject ! As of now, Apex doesn’t offers this feature. But we can run tests on single class as described above, so why don’t we use this feature to create test suites in Apex. But for that we need access to Apex Classes available in the org. Good news !!! Salesforce schema already has an Sobject called “ApexClass”, this sobject keeps information about all the classes in a SFDC org. One can query this Sobject for details like ClassName, Namespace, Body and length etc. Create a “TestSuite” and “TestSuiteClass” custom Sobject. “TestSuiteClass” will keep apex class name and namespace, because we can’t lookup or master details to ApexClass object. Test Suite Class will master detail on “TestSuite”. Create a Visualforce page/apex controller, that queries ApexClass sobject and presents a list of Apex classes to end user to select. These selected Apex classes then can be used to create a TestSuite/TestSuiteClass records. Now having this TestSuite and ApexStub class we can execute it in many ways, a slight challenge will be to hack around the governor limits imposed. For ex. we can create another Visualforce/Apex page to run tests available in the TestSuite. Also by using TestSuite and ApexStub class, we can also create applications that tells coverage etc. As RunTestsResult returned after running tests, have fine details about that too. Let me know what do you feel about this TestSuite concept, if its really worth moving forward like this. If you have some ideas and good feeling about it, we can join our efforts to create an opensource project for this. Getting Test Suite natively in Force.com Platform - Idea exchange ! Please promote it to make the platform better. Tolerado for WSC now works with Google App Engine ! This was a long time TODO, to integrate Tolerado for WSC with Google App Engine also. I am glad to share that its no more a TODO, all code changes are done to Tolerado framework and latest jars are available for download. Setup is really trivial, we just need to tell Tolerado the right Http Transport to pass to WSC Connector. For fine details on how to setup Tolerado with Google App Engine, please check this guide. Though this setup is really trivial, you just need to make following “one line” call from any startup java code for ex. Servlet Context Listener or any other code that gets executed before creating Tolerado Stubs. I usually prefer static blocks to save explicit calls. A detailed code snippet about using Context listener for the same is available here. Many of us prefer configuration files instead of Java code based configuration. I really hate config files. Still if you want me to release a config file to control HTTP TRANSPORT for WSC, please let me know. Any other suggestions, issues please let me know.